Like his brothers, Luis Fuentes is a risk taker; whether he's scaling the Rocky Mountains or dreaming of a future as an astronaut, he's always looking for the next thrill. Nikki Cruz lives her life by certain rules - don't trust a boy who says "I love you", boys lie to get their own way, and never date a boy from the south side of Fairfield. Then she meets Luis at his brother Alex's wedding and suddenly she's tempted to break all her rules. Getting Nikki to give him a chance is Luis's biggest challenge, until he's tempted by a gang-member to enter the same dark and violent world that nearly destroyed his brothers' lives. Will Luis's feelings for Nikki be enough to stop him from taking the ultimate risk? 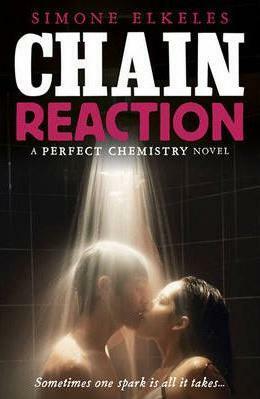 It seems like we've had a very long wait for the UK publication of the third book in Simone Elkeles series staring the Fuentes brothers so I can't tell you how excited I was to finally get my hands on a copy of Chain Reaction. As much as I'm sad to reach the end of this series I'm glad I finally got to read Luis's story and it was fantastic to catch up with Alex, Brittany, Carlos and Kiara too. If you haven't started this series yet then the books probably could be read in any order but I've fallen for each of these brothers so would highly recommend reading them all! Luis is an adrenaline junkie but living far away from his family's original home town has allowed him to keep away from the gang culture that sucked in both of his older brothers Alex and Carlos. Luis is the smart one, the one the whole family has high hopes for and the one who dreams of doing something important with his life. As much as his brothers have both turned their back on the gang culture they have always tried to protect Luis so he was never drawn into that life in the first place. But returning to the family home in Fairfield with his mother means reuniting Luis with all his old friends - friends who are now in gangs and who want Luis to join them. Luis first met Nikki at Alex's wedding but she doesn't want anything to do with a boy from the wrong side of town who is hanging out with gang members. History has taught her that boys like Luis are bad for you so no matter how hot she finds him she isn't going to give in to him easily. Luis is drawn to Nikki but are his feelings for her enough to stop him from following in his brother's footsteps and making the worst mistake of his life? I really can't resist the Fuentes brothers and Luis was no exception to that. He is just as cocky as his brothers, full of smart one liners and as confident as can be. He is also incredibly smart and wants to make a future for himself so I did find myself a little annoyed with him when he was so easily drawn into the gang life. I know there were reasons but I had expected a bit more from him considering what he'd seen his brothers go through and how intelligent he was. He still made me fall a little bit in love with him though, perhaps not quite as much as Alex and Carlos but not far off it! The chemistry between Luis and Nikki was off the charts and I couldn't put the book down because of it. Nikki has been through some really tough times so it was no wonder that she was wary of trusting anyone again, particularly considering the similarities between Luis and her ex! I enjoyed watching Luis break down her barriers though and I have to admit it would have been impossible for anyone to resist him when he was in full on charm mode. That boy could sell ice to the Eskimos and they'd thank him for it! I think one of my favourite things of the whole book was the interaction between the three brothers though. It was so good to catch up with Alex and Carlos and see what they're getting up to now and how their relationships have developed with Brittany and Kiara. The epilogue was so sweet it would give a diabetic an overdose but I absolutely loved it. I'm so sad to reach the end of this series but I'll tell you now if Simone Elkeles ever decides to write about the adventures of the next generation of Fuentes boys I'll be at the front of the queue to buy the books.